Usually short distance from shore. Low temperatures, possibly limited visibility, could be day or night operation, usually low wind speeds. Deploy hovercraft rapidly from road trailer and launch from river or lake bank. Proceed to victim(s) at low to medium speed depending upon distance, 25 mph (40 km/hr). Maneuver up to or around victim(s) to achieve best retrieval position given the situation. Could be loaded from either side or front of hovercraft. It is essential that hovercraft does not overshoot and overrun victim(s) at speed. To retrieve victims clinging to ice ledge, deploy in-water rescuer wearing Mustang Ice Suit so hovercraft will not dislodge victims' hold. Load into hovercraft or onto stretcher if required. May be necessary to drag up to 250 lb (113 kg) person over the side and onto a stretcher. Three persons may need to be carried at one time. Could be grossly overloaded with multiple victims. Return hovercraft to ambulance pick up point at medium speed fully loaded and unload victim(s) on dry land if possible. Hovercraft may be required to rescue animals from mud or ice. Temperate conditions, wind up to beaufort 4 (15 mph, 24 km/hr), strong current with small wavelets (1 ft max) (304 mm). Rapidly deploy and launch hovercraft from riverbank or suitable area nearest to victim(s). May need to carry hovercraft over steep or wooded bank. Proceed to rescue at low to medium speed. Maneuver up to victim(s) to achieve best retrieval position in given conditions. Important that craft is able to hover stationary close to victim to facilitate loading even in fast current conditions. Board one or two persons from tree, rock or log refuge. May be necessary to pluck victim(s) from fast flowing waterway. Return hovercraft to dry land or ambulance pick up point at medium speed fully loaded and unload on dry land where possible. Hovercraft may be required to rescue animals from fast flowing water. Ability to search for 2 hours at up to medium speed 25 mph (40 km/hr), over wide shallow and narrow twisting waterways. Temperate conditions, low to moderate winds 15 mph (24 km/hr), low currents. May be necessary to proceed at night at low speeds for limited periods. Ability to locate and rescue 2 or more victims from isolated land, trees, roof, etc. Hovercraft must be able to maneuver in relatively confined waterways even inside flooded buildings, and retrace passage if necessary. Ability to manhandle hovercraft over fallen trees and around large obstacles is needed. May be required to carry limited amount of emergency rations and supplies to remote areas 400 lb. max. (181 kg). 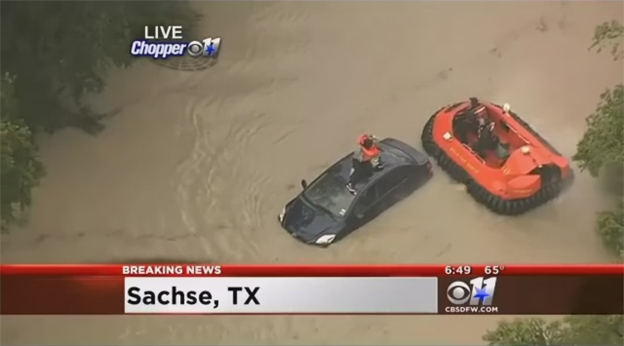 Hovercraft may be required to rescue animals from floodwaters.